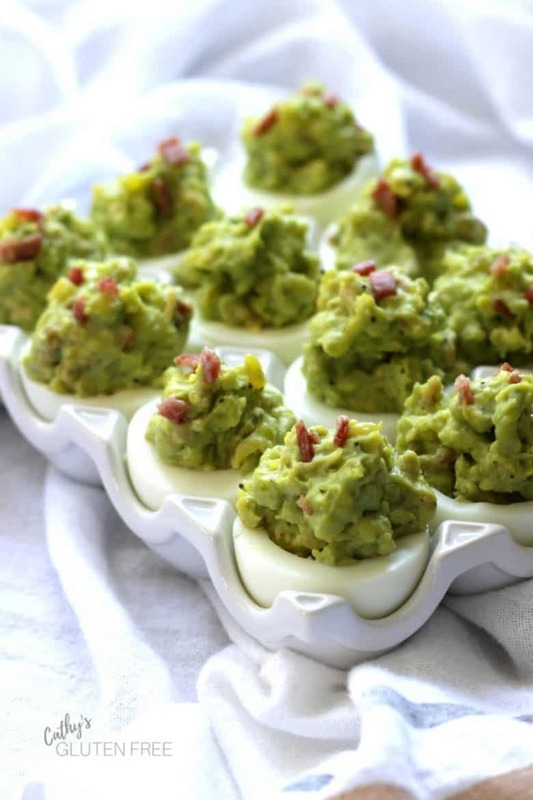 Celebrate Easter with creamy Deviled Egggs with Bacon and Avocado this year. Easter is just around the corner. Eggs are the quintessential symbol of the celebration of new life. 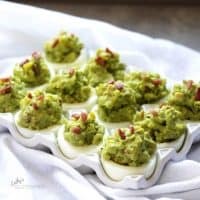 Deviled Eggs with Bacon and avocado is my latest creation. This is how I’m liking eggs this year! Now that I have an Instant Pot, I don’t boil eggs any other way. I love the consistency, and I swear that they are easier to peel! We like our “hard” boiled eggs to still be a little moist on the inside. So, for eggs just like the ones in this photo, follow the instructions in the recipe exactly. I find that eggs that aren’t extremely fresh peel better than very fresh ones. I am also convinced that eggs cooked in the Instant Pot are easier to peel than those cooked on the stovetop. 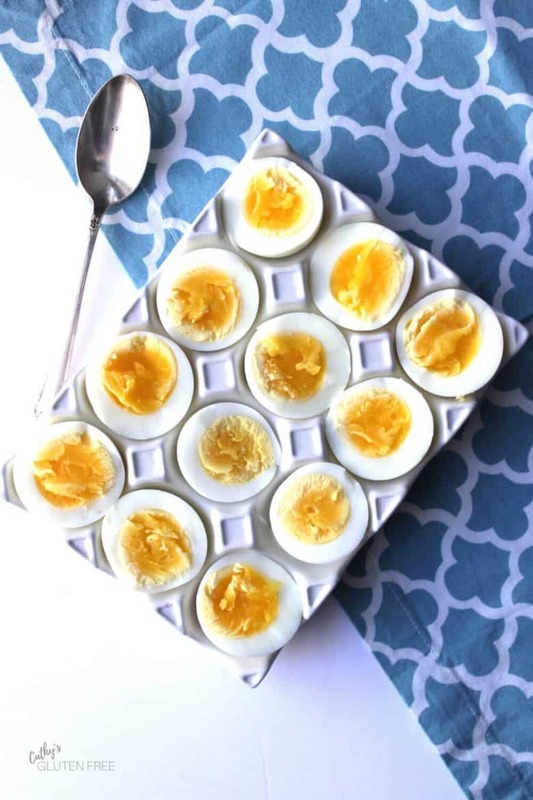 There are lots of hacks online for peeling eggs, but I think the best idea comes from fellow Canadian food blogger Elaine, at Flavour and Savour. Tap the boiled egg on the broad end to crack it. That’s where the air pocket forms. If you can break into the air pocket immediately, it’s a simple matter to then pull the rest of the shell away. 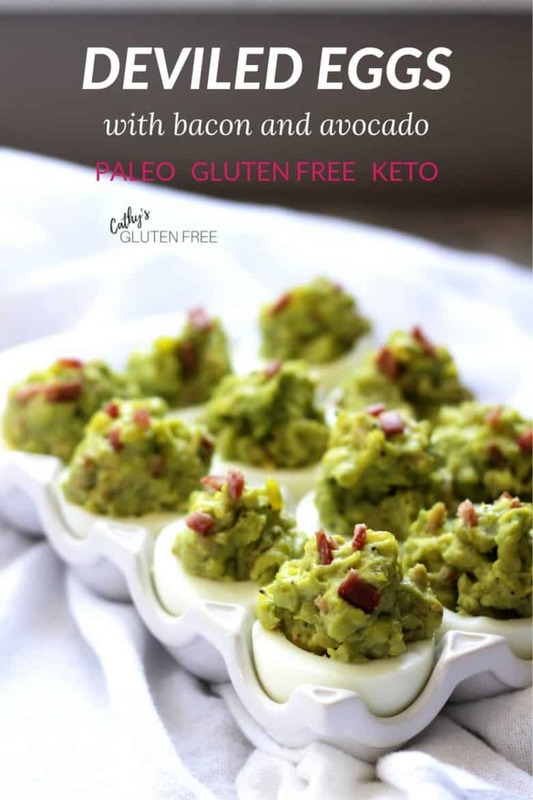 I think you’ll really enjoy Deviled Eggs with Bacon as a nutritious appetizer or star of the brunch or lunch plate. There’s a very handy guide for How to Cook Bacon in the Oven from chef Markus at Earth, Food and Fire. His method is a great way to cook up lots of bacon at once. Perhaps cook the whole pound, even if only a couple of you are having some for breakfast. Then put the rest away in the refrigerator for recipes such as this deviled egg one, for salad topping, for Bacon and Cheese stuffed Mushrooms, or for Creamy Sweet Potato Salad with Bacon. Five ingredients is all it takes to prepare these tasty deviled eggs. 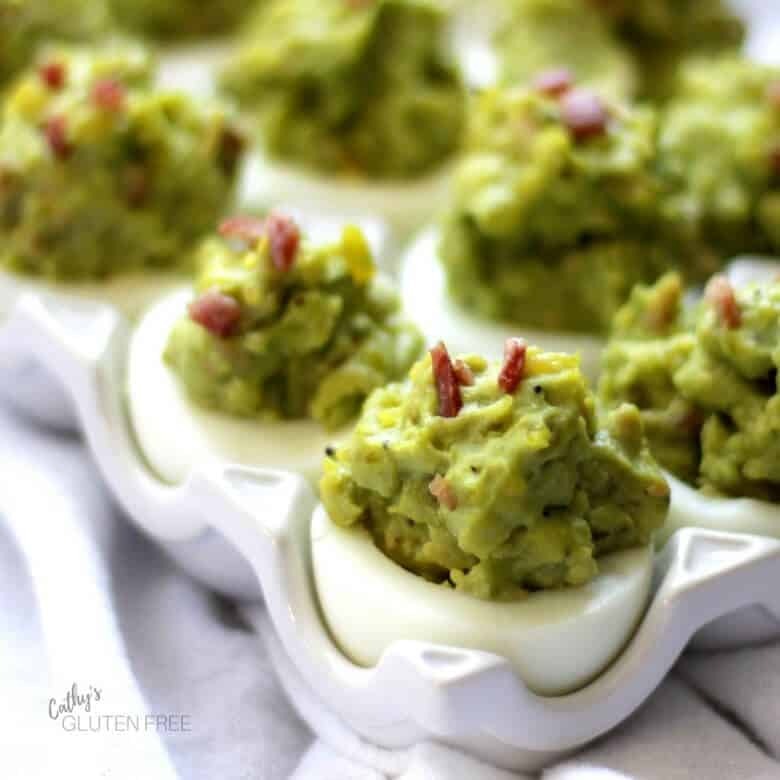 Because of the avocado in here, Deviled Eggs with Bacon and avocado are best served right away. However, there are several things you can do ahead of time. Have Everything Seasoning on hand. It keeps in a jar up to a few months. Make the mayonnaise up to three days ahead. Boil and chill the eggs a day or two ahead. Cook and chop the bacon a day or two ahead. 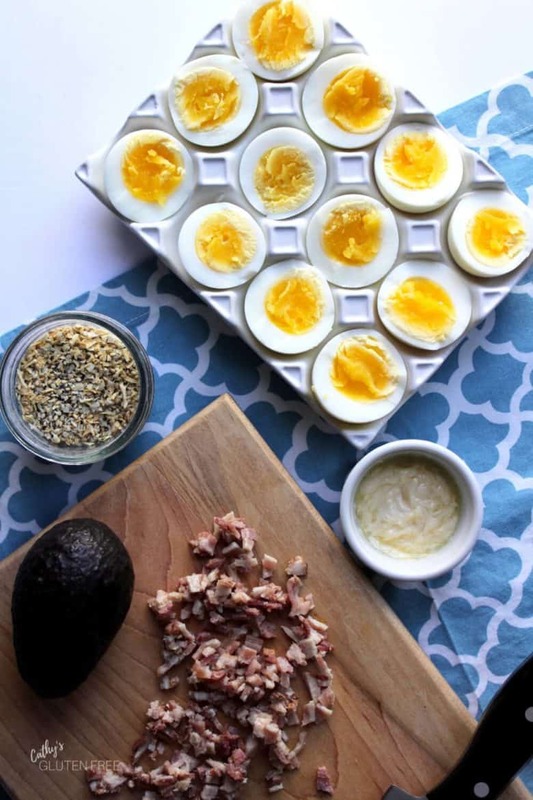 In the morning of the day you’ll be serving your deviled eggs, cut open the eggs, and remove the yolks. Mash together all of the filling ingredients except the avocado, and store it in a sealed container in the refrigerator. At the last minute, mash the avocado into the other filling ingredients. Scoop the filling into the egg whites, and serve. 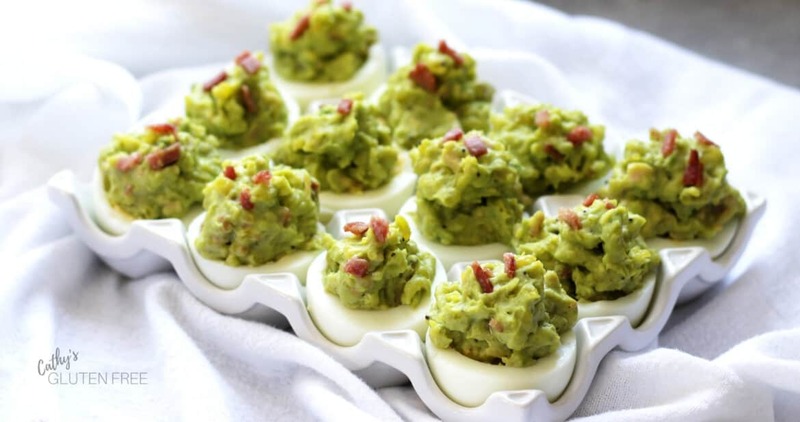 Deviled Eggs with Bacon are made creamy with avocado and mayonnaise. Everything Seasoning completes them perfectly! That's it! Five ingredients for a unique twist on a traditional favourite. Hard boil the eggs and plunge them into ice water. I cooked mine in the Instant Pot on a trivet with 1 cup of water. a) Set Pressure Cook for 5 minutes. b) When 5 minutes are up, don't touch the pot, but set a timer for 2 more minutes. c) When two minutes are up, turn the valve to release steam. d) As soon as the button drops, open the Instant Pot, lift out the trivet with eggs, and plunge them into ice water. Peel the eggs. Cut them in half. Remove the yolks to a small mixing bowl. Cut open the avocado and remove the pit. Scoop out the inside and add to egg yolks in bowl. Scoop the mashed filling into the egg whites, piling it up into high mounds. Garnish with reserved bacon, if desired.